Michael Learns to Rock (also known as MLTR) is a pop/soft rock quartet formed 1988 in Denmark. The Danish band released their first album, Michael Learns to Rock in September 1991. Its track “The Actor,” was a hit in Scandinavia and Asian countries, selling 25,000 copies and earning gold status in Indonesia alone. After the success of its first album, the band’s follow-up record, “Colours,” sold over a million copies on the strength of the singles “Sleeping Child,” “25 Minutes,” and “Out of the Blue”, in 1993. Michael Learns to Rock's greatest hits album Paint My Love sold 3.4 million copies when it was released in October 1996. MLTR was composed of Jascha Richter (singer and keyboard), Mikkel Lentz (lead guitars and additional keyboards), Kåre Wanscher (drums and percussion) and and Soren Madsen (bass), until Madsen left in 2000 to go solo. MLTR took a prolonged break starting since then, but regrouped in 2004. More albums followed then, accompanied by successful tours in at least 21 countries which included the Philippines. In total, MLTR have played in large and small open-air and closed-hall stage concerts, did TV appearances, performed unplugged and sing-back gigs, over a period of 25 years. Their biggest and most comprehensive Greatest Hits collection, simply titled “25”, will hit stores and digital downloading sites soon. “25” marks the first time that all of Michael Learns to Rock’s soundtrack of hits are presented in one collection! 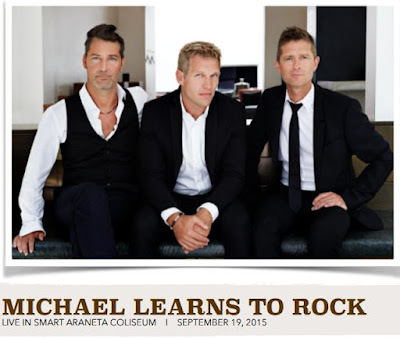 And as Michael Learns to Rock celebrate its 25th year anniversary, Filipino fans can once again look forward to a night of rock and heartfelt emotions with the MLTR band when they deliver their greatest hits live in a one-night-only concert this September 19 at the Smart Araneta after 7 years! Be part of this activity celebrating Michael Learns to Rock's 25 years of great music. Experience one big sing-along concert party as Michael Learns to Rock hits the stage with their greatest hits. Sing it loud, sing it live with Michael Learns to Rock! Catch them at Smart Araneta Coliseum, 8 PM on September 19, 2015. Grab you tickets now Ticketnet Outlets or visit ticketnet.com.ph for more information.